Food of Life: Ancient Persian and Modern Iranian Cooking and Ceremonies – 2016 Holiday Sale! Completely redesigned for today’s generation of cooks and food enthusiasts, the 25th Anniversary Edition of Food of Life: Ancient Persian and Modern Iranian Cooking and Ceremonies by Najmieh Batmanglij (Mage; $54.95 640 pages); provides a treasure trove of recipes, along with an immersive cultural experience for those seeking to understand this ancient and timeless cuisine. This edition is a more user-friendly edition of the award-winning and critically acclaimed cookbook series which began in 1986. Food of Life provides 330 classical and regional Iranian recipes as well as an introduction to Persian art, history and culture. The book’s hundreds of full color photographs are intertwined with descriptions of ancient and modern Persian ceremonies, poetry, folktales, travelogue excerpts and anecdotes. The 2011 Edition of Food of Life is a labor of love. The book began in exile after the Iranian Revolution of 1979 as a love letter to Batmanglij’s children. Today, as accomplished adults in their own fields, her two sons, Zal and Rostam, encouraged her to redesign the book for their generation. Food of Life propels Persian cooking into the 21st Century, even as it honors venerable traditions and centuries of artistic expression. It is the result of 30 years of collecting, testing and adapting authentic and traditional Persian recipes for the American kitchen. Most of its ingredients are readily available throughout the U.S. enabling anyone from a master chef to a novice to reproduce the refined tastes, textures, and beauty of Persian cuisine. Food-related pieces from such classics as the 10th century Book of Kings, and 1,001 Nights to the miniatures of Mir Mosavvar and Aq Mirak, from the poetry of Omar Khayyam and Sohrab Sepehri to the humor of Mulla Nasruddin are all included. Each recipe is presented with steps that are logical and easy to follow. Readers learn how to simply yet deliciously cook rice, the jewel of Persian cooking, which, when combined with a little meat, fowl, or fish, vegetables, fruits, and herbs, provides the perfect balanced diet. *Master recipes with photos illustrating the steps. *Choices for cooking recipes such as “kuku” in oven or on stovetop. Batmanglij’s cookbooks reflect the tradition and culture of her Persian background and the multi-tasking demands of a busy mother and professional. She views preparing a meal not only as a culinary experience, but also as a means to bring family and friends together. She encourages her readers to do as she was taught in Iran: to cook, to laugh, to tell jokes and stories, and to recite poetry. Over the past quarter century, Batmanglij’s books have acted as both a beacon and a bible to Iranian-American and mixed-ethnicity families in the English-speaking world. Food of Life is one of the few volumes whose breadth ranges from the exacting measures that go into cooking a perfect bowl of rice to the intricacies of a traditional ancient Persian marriage ceremony. Her life and her work meet at the vortex of feminism, tradition, ceremony, and the nourishment of body and mind, proving that none of these concepts need be foreign to one another. You know more about Persian food than you might think. When you ask for oranges, pistachios, spinach, or saffron, you are using words derived from Persian that refer to foods either originating in the region or introduced from there, for Persia was a great entrepôt of the ancient and medieval worlds. The land was the first home of many common herbs, including basil cilantro, and spices such as fenugreek and cumin, as well as vegetables that include fava beans and chickpeas. Iran was also home to scores of familiar preparations, including sweet and sour sauces, kababs, noodles, marzipan, and baklava. Such preparations are most delicious in their original forms, which you will find in the recipes in this book. The publication of this book coincides with the arrival of the Persian new year, Nowruz. Nowruz is the most important holiday for Iranians all over the world. Nowruz ceremonies consist of a series of symbolic rituals dating back to pre-Islamic ancient times. Nowruz is not a religious holiday but a celebration of the earth, which everyone can enjoy wherever they are and whatever their religion may be. The Nowruz celebrationalways begins on the first day of spring marked by the vernal equinox, or Tahvil, when the sun crosses the celestial equator. This year Nowruz falls on March 20 at 7:21 PM Eastern DST. To welcome the new year, Iranians thoroughly clean and rearrange their homes. They buy new clothes, bake pastries, germinate seeds, color eggs, and prepare a menu of green dishes as signs of renewal. Troubadours, called Haji Firuz or “heralds of rebirth,” disguised with makeup and wearing red outfits, sing and dance through the streets with tambourines, kettle drums, and trumpets to spread good cheer and the news of the coming new year. In every Iranian household a ceremonial setting called sofreh-ye haft sinn is spread to symbolize rebirth and renewal, and to welcome the arrival of the new year (see page 562). All the recipes come from the land Europeans have long called Persia. That name is the Hellenized form of Pars, the southwestern province that was the homeland of the rulers of the first Persian Empire. They, however, called themselves Iranians and their country Iran, the name of their ancestral tribes. Nowadays the words are used interchangeably, describing a people whose civilization and cuisine are ancient indeed. Cooking plays important roles in every culture, but Persian cuisine can claim a relationship to its native land that is uniquely deep and intricate. This book celebrates the central place of food in the life of Iran, a story extending back almost 4,000 years, when recipes were first recorded in a cuneiform script on clay tablets. Food of Life, the title of the book, comes from the Persian words nush-e jan, literally “food of life”—a traditional wish in Iran that a dish will be enjoyed. For the updated 1993 edition the title was changed to New Food of Life. Now, for the 25th anniversary edition the title returns to its original name, Food of Life. When Najmieh Batmanglij’s Food of Life was first published back in the mid-1980s, it was probably ahead of its time. American cooks were still concentrating on the cooking of France and Italy, and even Indian cooking was somewhat on the fringe. Let’s face it, we probably were not ready politically for an Iranian cookbook in those days, either. The book got a few really good reviews, but remained something of an obscurity. Times have changed, though, and thankfully because Batmanglij has just republished the book in a gorgeous expanded edition. If you’ve ever been curious about Persian cooking — and that means just about anyone who has ever tasted it — this is the perfect introduction. Rice is at the heart of Persian cooking and there are 60 pages devoted to it in the book. This may seem excessive for those whose idea of rice cookery is limited to boiling a bit of basmati. But if you’ve ever tasted a perfectly made tah-dig (fluffy rice served with a delicious cap of crusty golden fried rice), you’ll appreciate the care and artistry that is required. Here’s a very brief summary: First, the rice has to be rinsed thoroughly. Cook it briefly in a lot of boiling water, then drain and rinse again. Combine part of the rice with a yogurt-saffron mixture and spread it across the bottom of the pot. Carefully spoon in the rest of the rice. Cook briefly over medium-high heat to get the crust started, then reduce the heat and cook for 70 minutes more, with the lid wrapped in cloth to absorb extra moisture. And then you get the process for unmolding. For the faint of heart, there are also half a dozen “cheater” tah-digs –- crusts made with lavash, potatoes or just plain rice stained with saffron. And in this updated version of “Food of Life” there are also instructions for preparing many of the dishes in a rice cooker. It is the kind of late-February afternoon that hints at spring. Najmieh Batmanglij is in her element – cooking in the large room graced with tones of honeyed oak, smooth stone relics and the sunlight from a wall of windows at the back of her Georgetown home. She likes the CD of Iranian music turned way up; the aromatics are already at full volume. Wafts of burbling basmati rice and saffron-infused rosewater draw guests close to the long butcher-block counter, where bowls of bitter oranges and round trays of sprouted lentils herald the approach of Nowruz, the Persian new year. The Iranian native says it’s time for her to make some noise – two grown children, more than three decades and several cookbooks after she and her husband, Mohammad, came to America in exile. Naj, as she is affectionately known, wants more Persian food in more home kitchens. Washington’s fooderati and its Iranian community recognize Batmanglij as a premier advocate of Persian food. There are perhaps a dozen other Iranian cookbook authors alive today whose recipes appear in English, she estimates, and hundreds of people in the States have taken her cooking classes. Yet Batmanglij remains a low-key sensation, making what she says is the world’s most influential, least understood cuisine. She wishes Iranian culture could be viewed apart from Iranian politics. Chefs are at the forefront of Batmanglij’s fan base. They know what’s good, and they are inspired by the ingredients and techniques she brings to the table. It is why she has been asked to teach for the past 10 years at the Culinary Institute of America at Greystone in Napa Valley, Calif., during the weeklong World of Flavors Conference. Chef-restaurateur Jose Andres first met Batmanglij more than a decade ago. They were introduced by Lidia Bastianich, a fellow member of Les Dames d’Escoffier (“she’s so warm; a soul mate,” Batmanglij says). When local cookbook author Joan Nathan threw a party for the celebrity chefs who volunteered to cook a series of inaugural dinner fundraisers in 2009, she enlisted Batmanglij to make Persian wedding rice studded with fruits, nuts and spices. It was the hit of the night. Andres has invited Batmanglij to teach dishes to the kitchen staff at Zaytinya, his Mediterranean restaurant in Penn Quarter. Rice is the jewel of Persian cookery, Batmanglij says. It is grown in Iran’s northern Caspian provinces. She makes some every day, in ways that elevate it. They can be as simple as simmering it with a sachet of crushed cardamom pods and a splash of rose water, or as involved as steaming it with saffron and creating a golden crust (see step-by-step guide at washingtonpost.com/food). Batmanglij powers through the prep of simultaneous dishes like a seasoned instructor, explaining the steps for terrific pistachio and pomegranate meatballs and an herby, frittata-like kuku. But when she describes the allure of fresh fenugreek or the symbolism of eggs and fish and sweets for the new year, the 62-year-old morphs into her younger self, filled with passion. Like the stunning images of the woman with flowing dark hair, in family photos hung around the room. Batmanglij learned her mother’s dishes well and took notes at the elbow of her aunt, a pastry chef. When the Iranian revolution occurred in 1979, she and her husband fled to Vence, France. She took cooking classes there and began translating her mother’s recipes into French. At her neighbors’ urging and with their help, she put together a compilation of 50 recipes, her first, called “Ma Cuisine d’Iran” (1984).During that time she began researching and saving string for what would become “Food of Life” and “New Food of Life,” the latter of which was featured in a 1993 Post Food section article. “In exile,” in America, she was quoted, “you become so much more conscious of your culture, and ours is so beautiful.” She saw the book as a love letter to her sons, who she figured might never see the Iran she knew. Last year, Zal the filmmaker, 30, and Rostam the indie rocker, 26, encouraged her to update the book for their generation. So their mother added recipes and series of instructional photos, lots of tips and an expanded glossary of ingredients. She came up with vegetarian alternatives and substitutions, testing the 330 recipes at least three times each. The result: a handsome 25th anniversary edition supplemented with more stories of tradition, more poetry and Persian illustrations. Batmanglij was able to translate many 16th-century Persian recipes and bring them to life. So in the weeks before this year’s Nowruz, her favorite time of year, Batmanglij has even more reason to be happy. The lentils she sprouted will grow by inches; they are ornamental signs of rebirth for the holiday that officially begins with the vernal equinox. She will help plan celebrations for Iranian students at George Washington University and prepare to lead a culinary tour of Rockville’s Yekta market and restaurant in April. One can experience Persian cuisine without entering Iran—Persian American chef Batmanglij presents an outstanding and complete reference for Persian cooking and culture. Novice to expert cooks will appreciate the succinctly detailed ingredients lists and instructions to prepare rich Persian appetizers, soups, vegetables, meat, rice dishes, braises, desserts, breads, preserves, drinks, and snacks. The recipes—accompanied by tips, glossaries, and Persian-English/English-Persian ingredients translations—result in sumptuous dishes. 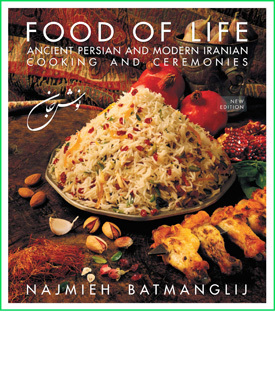 Readers can glimpse the author’s Iranian heritage from her personal anecdotes and short narrative of Persian history….Batmanglij’s clear and detailed instructions will encourage cooks to prepare Persian meals. Please browse. I am very excited about this new edition. After thirty years of cooking outside of Iran, and in response to the input of my readers and fellow cooks, I have refined the structure of the book in general and each recipe in particular. With this edition I have unified, streamlined, and turned some of the recipes that began as my mother’s into my own. Most recipes now have a photograph of the finished dish facing them, and for some of the classics, such as saffron rice with golden crust, jeweled rice, fillet kabab or baklava, I have included step-by-step photos to guide you. I have also included vegetarian cooking variations for many of the recipes. Here and there are some of my food memories from my childhood in Iran. Colorful spreads with information about some classic Persian ingredients such as saffron, bitter orange (narenj), and the rose are scattered through the book. There are also some street food scenes from contemporary Iran. The first edition of Food of Life appeared when my sons, Zal and Rostam, were toddlers. Now, as grown men, they have inspired me to redesign the book and make it accessible for a new generation of readers and a broader audience. None of the recipes requires cooking techniques that are unusual or difficult to learn. To help in planning, I’ve listed preparation and cooking times for each dish, indicated whether it can be made in advance, and noted how many people it will serve. These days, almost all of the ingredients in the recipes are available at your local supermarket—not the case in the 1980s. Those that might not be or that require preliminary preparations are marked with an asterisk, which indicates that they are discussed in How To Make and Store Kitchen Ingredients on page 529 and also in A Glossary of Ingredients, Terms and Persian Cooking Techniques on page 599. Please do check—even read through—the glossary: The entries describe the history of each ingredient and its use in Iran, and explain how to shop for it and how to prepare it. I suggest you try to find the original ingredients since they are widely available in the U.S. The guide to Iranian Stores and Restaurants on page 616 offers a comprehensive list of shops around the country that sell specialized ingredients. Several of them have a good Internet presence and can ship you whatever you need, wherever you are. I want you to use this book to get together, to cook, to laugh, to tell jokes and stories, and to recite poetry, just as Iranians do. Nush-e Jan! literally “food of life”—a traditional wish in Iran that a dish will be enjoyed. Select any image below to open and download a pdf file of that recipe. NAJMIEH BATMANGLIJ, hailed as “the guru of Persian cuisine” by The Washington Post, has spent the past 30 years cooking, traveling, and adapting authentic Persian recipes to tastes and techniques in the West. The 25th Anniversary Edition of her book Food of Life: Ancient Persian and Modern Iranian Cooking and Ceremonies was called “This summer’s most coveted tome” by Vogue. Her Silk Road Cooking: A Vegetarian Journey was selected as “One of the 10 best vegetarian cookbooks of the year” by the New York Times; and her From Persia to Napa: Wine at the Persian Table won the Gourmand Cookbook Award for the world’s best wine history book of 2007. She is a member of Les Dames d’Escoffier and lives in Washington, DC, where she teaches Persian and Silk Road cooking, and consults with restaurants around the world. Her most recent book is Happy Nowruz: Cooking with Children to Celebrate the Persian New Year. Her web site is www.najmieh.com. Food of Life: Ancient Persian and Modern Iranian Cooking and Ceremonies - 2016 Holiday Sale!